We are a Montessori Based nursery – But what does this mean? Montessori is a system of education for young children that is based on self-directed activity, hands on learning and collaborative play. In a Montessori classroom the children make creative choices in their learning, while the classroom and the teachers offer age appropriate activities to guide and develop the process. The environment is a key part of a Montessori classroom with the prepared environment equally as important as the practitioners in delivering a Montessori start to education. 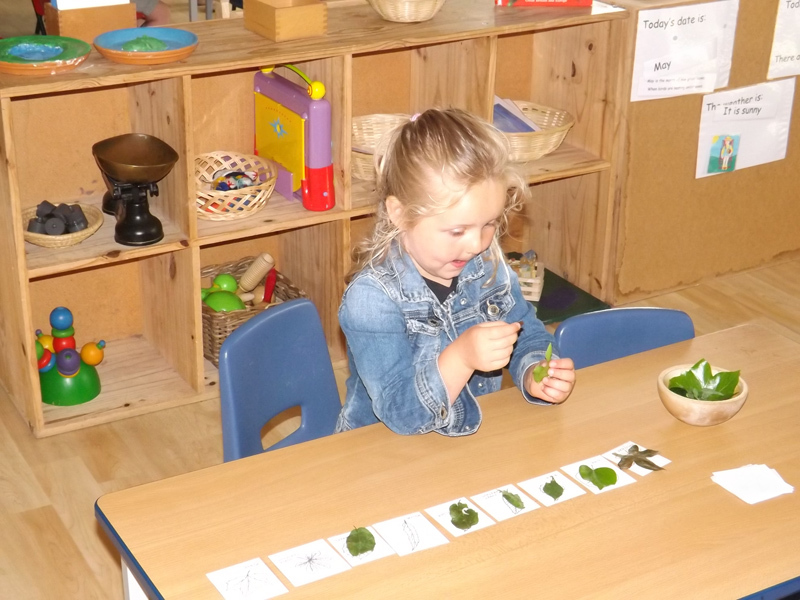 The prepared Environment is designed so that the child has maximum ability for learning and exploration- Everything is out for the children to access – It is there for them to choose to explore and to experiment with. As practitioners we would guide the children to try something new or join in with a material which they have chosen to demonstrate how to use it. Each day we use the children’s ‘record sheet’ to plan which activity to introduce to the child or perhaps revisit based on observations previously made. These activities incorporate the Montessori Materials but also include other activities to cover all the areas of the Early Years Foundation Stage. The Montessori Materials are a key part of the Prepared Environment- they are designed to teach a lesson and isolate an error so the child can correct it themselves. Materials usually belong to a succession of lessons, which, in the beginning are simple and concrete but progressively become more and more complex. Once the children have been shown the equipment and activities they are encouraged to choose freely as everything in the room is available to them. Children are invited to join the practitioners to complete activities during the work cycles at nursery mostly on a one to one basis- this ensure observations about child’s development are evaluated and planned for efficiently. Unless language is required for the presentation – ie we are introducing language all presentations are completed in silence to emphasis the action being completed – if we were giving a constant commentary of our actions the children can become confused and get a sensory overload. There is mostly one of each activity or material – this helps the children develop patience and turn taking as each activity is designed for one child only … and never asked to pass it to someone else or that it is their turn now – it is the child’s until they decide to put it back where it belongs for someone else to choose. The teacher’s role in the Montessori Nursery is to be a directress, rather than a traditional teacher: we assist the children towards learning, rather than instruct them. We are the tool that the children are invited to use to make sense of their surroundings. In all areas of this setting, the basis upon which all activities are based, are the Montessori ethos and later, the didactic materials. Each adult who supports our children’s learning, has genuine respect for each child as an individual. We value Montessori’s holistic approach to learning and firmly, placing emphasis on cultivating healthy, safe, independent children through their emotional, social, physical and academic development. In our Infant community our learning activities are based around heuristic learning and exploration. Our youngest children have their own treasure baskets to explore and also share a variety of other play and exploration activities. As our children become mobile, they are provided with the space to freely play and explore an environment which is prepared exclusively for them. What Makes A Montessori Nursery Different?